Jervon Graves began gaining notoriety the first game of his junior season, a game covered by KC Metro Sports against Olathe North. Olathe South won the game, and with the help of Graves went on to win 8 straight games, advance to the Sectional Round of the playoffs, and finish with a 9-2 record in 2005. Although he was not known for his pass rushing skills, Graves proved during the season that he was a nearly unmovable force in the center of the Olathe South defensive line. Teams were offensively unable to create holes around any area Graves occupied. 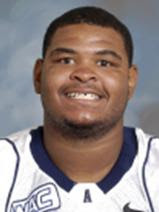 Following the 2005 season Graves was named All-State Class 6A in Kansas for his play at defensive tackle. The honor was certainly not his last. In 2006, Graves led Olathe South to a 6-3 regular season record, including a District Championship. The Falcons lost to Olathe East in the Regional Round of the playoffs, 33-7. The school's down year wasn't because of Graves--the senior tackle had a great year. From his defensive tackle position he recorded 69 tackles (38 solo), 6 tackles for loss, and forced 3 fumbles. Graves was once again named Class 6A All-State, in addition to being a member of the Kansas Top 11 team. Graves was also in the running for the Buck Buchanan award. For his career Graves made 146 tackles (54 solo) and had 25 tackles for loss. Following his career at Olathe South Graves went on to play D1 at Utah State. He has played in every game at the defensive end position in his thee year career.